Editor’s note: Amanda Klasing is a women’s rights researcher at Human Rights Watch. The views expressed are her own. This Saturday is World Water Day – a day the United Nations and its member countries have devoted to promoting sustainable management of the world's water resources. It seems fitting that it falls in March, women’s history month, because the lives of women and their families are inextricably linked to access to clean water and sanitation. 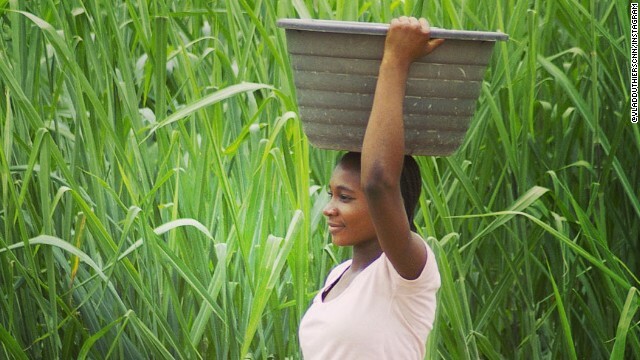 Over the last eight years, I’ve spent countless hours speaking with women and girls in Haiti about how access to clean water and sanitation shapes their lives. Long before the 2010 earthquake, women told me how poor drainage and large-scale erosion left many homes, communities, and agricultural plots at risk of flooding. When hurricanes and tropical storms hit, they had watched as their homes, their families’ crops (and livelihood), and the only roads that connected them to the rest of society washed away toward the ocean. Women and girls told me they spent many hours of their days fetching water or traveling to rivers and streams to do their families’ laundry. Those duties kept some girls from getting to school on time, causing them to miss important lessons and fall behind their male classmates. After the earthquake, women and girls told me that they feared going to the bathrooms in camps for the displaced because they weren’t secure. They described being pinched, poked or leered at by boys and men in the displacement camps when they washed themselves out in the open, because there was no safe and private place to bathe. Some gave birth in the dirt in tent camps or in the street without access to running water. Countless mothers have told me what it’s like to care for children with diarrhea caused by water they know makes them sick. Some lost children or partners to the cholera epidemic, which has killed at least 8,700 people and sickened over 700,000 in Haiti since 2010. Occasionally, international groups gave them water purification tablets. Often, though, they had to drink from the same water source that killed their loved ones. Lack of access to clean water and sanitation directly affected their health, their education, and even their risk of violence or death. Their stories are not unique to Haiti. The United Nations estimates that 800 million people lack access to safe, clean drinking water and a whopping 2.5 billion lack access to sanitation. It wouldn’t take much to improve the situation. People around the world have experimented with small, cost-effective projects – from rainwater collection, to eco-toilets that don’t require water, to basic educational programs on good hygiene. Inevitably, some large-scale infrastructure investment will be needed too. This year, countries are laying the groundwork for the next great agenda for poverty alleviation after the U.N.’s Millennium Development Goals run out in 2015. Gender equality and improving access to water and sanitation are both on the current agenda, and yet almost 1-in-7 people still lack access to clean water, and 1-in-3 to a toilet. The burden of this falls on women and girls. This time around, policymakers need to understand that water and sanitation are both key to poverty reduction and sustainable development – and to achieving gender equality. Next entry »What I'm reading: Why would Obama administration do this? Oh lord won't ya buy me a Mercedes Benz. Lol @ RZ, why? Dont your friends all have porches? Oh...you must make amends! Lol gm btw. Not very sympathetic of me to make such a remark, I know. But seriously, this article doesn't sound like a plea for water. More like a plea for money. What are we to do? Book a flight to Haiti to dig everybody wells? C'mom?? Let Washington and the MIC do it instead of spending $BBs on so much negative horse crap. What a waste! Would be nice if we could just add a couple of letters to make water rather than war. Good point...not to mention didn't we all send over $billions to Haiti in 2005 with the help of Bill Clinton..enough to get a good water filtration system for sure..I like the little water bottle on Shark Tank with a built in filter..about $30...every one should have one. And good grief! Just look at the picture attached to these article!! A pretty young healthy looking smiling women caring a big basket aside tall lush green vegetation. Don't know if it's food or laundry, but what's up with that?!? Certainly doesn't look like a sickly Ethernopian with flies crawling out of it's mouth dehydrating on a dried of desert seabed somewhere! She looks like she doesn't have a care in the world. Poor choice of a photo. RZ's Mercedes-Benz/buy-me comment started my day with amusement. Which came first: the Porsche or the productivity? Simply take an old Volkswagen and park it so tight up along the front door of your house that you can step directly from the car right into the house and vice versa. And voila! Now you got a porche. I have never owned a Porsche. Lol gm @ Joey, totally agree with your first post. The first laugh of the day is always the best and todays was a rip~roaring good one! 😉 and you can see since i couldnt even spell porsche correct, ive never owned one either! Lol ty @ RZ but honestly i dont wanta porsche! Ill stick with my ford f150! Ya know my doctor is from haiti and returns there often. He advised me NOT to send money. He said the govt. confiscates it and it isnt used for what weve intended it to be used for. The best he said you can do is donate your skills and time. Ask your doctor about our paying taxes. Might also be a form of confiscation being spent on things it was never intended for. Well yeah, but is that Haitian pizza with imported bottled water, or New York pizza with water piped in from the Catskills? Lmao @ RZ it comes with Troll Beer and its brewed in TJI! Will Turkey blockade the passage out of the black sea.